Hudson Marina is located at 4575 South Wilson Blvd. Orange Beach, AL 36561. It began as a Charter Boat Fishing Marina. It has always been family-owned. The harbor catered to private 6-pack charter fishermen who rented wet slips to run their business out of. Everyday was packed with Red Snapper, fish cleaning, and boat captains. 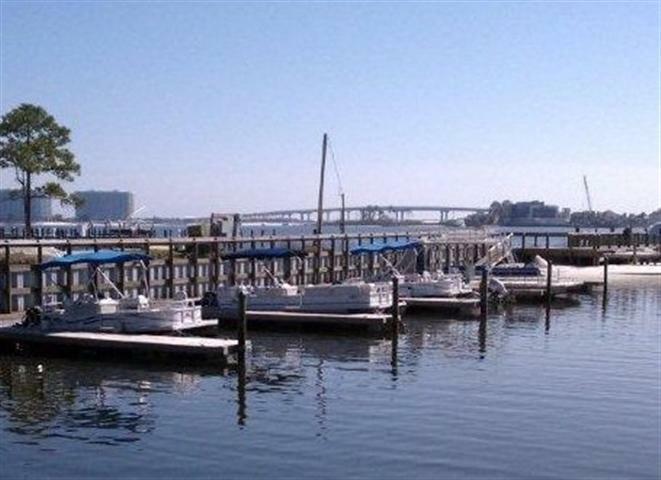 After Hurricane Ivan, a large part of the marina got destroyed, and had to be rebuilt. This was when the 300 foot pier was constructed. The new pier provided more space for our small marina to grow. We began by adding Jet ski’s and waverunners to rent in addition to going on a party boat fishing charter aboard the America II. After a few years, Pontoon boats and kayaks were added. Then came the paddle boat and the conversion of the American Star from a dolphin cruise boat to the new pirate ship cruise! This took an entire year of reconstruction from the hull of the boat up in order to make her resemble an exact replica of the Pinta, which cruised across the Atlantic Ocean back in the early 1900’s. With the success of bringing pirates to the island, parasailing aboard the Sky Pirate in the one and only jolly roger (skull and crossbone) parachute is now available! The newest addition is our dinner cruise boat which is expected to run on the Fridays and Saturdays for a more unique dinner in the Orange Beach, Gulf Shores, Perdido Key, Fort Morgan area. The marina originally got its’ name from the Hudson Family. In 1998, the Jones family took it over and kept it as a small, family-owned business. 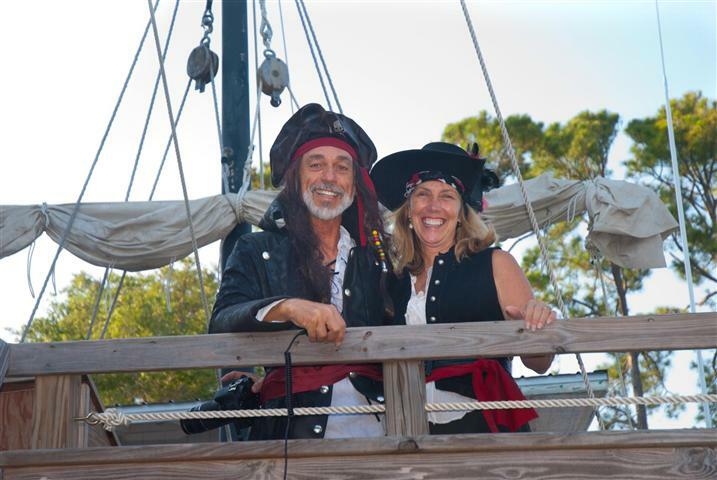 Our business caters to helping other families visiting in our area have a place to create long-lasting and unique memories on the Gulf Coast. By offering such a wide variety of things to do and different activities, it allows for your family to stop wasting time searching and utilize all of your time by doing! The Jones family consists of husband and wife team, Laurie and Rodney. Captain Rodney enjoys his time most as Captain Shiver-Me-Fingers on the American Star! Laurie helps to keep the family organized within the office, and keeps the business moving forward with her creative ideas. Their children, Willie - the oldest, Linden - the youngest, and GracieLou - the beloved water activity pup, help out during the busy season wherever the crew is needed. Gracie never allowed herself to be left behind when it came to a family day of fun on the water, and neither should you! Come on down to meet us, and we hope to make a lasting relationship with you and your family! 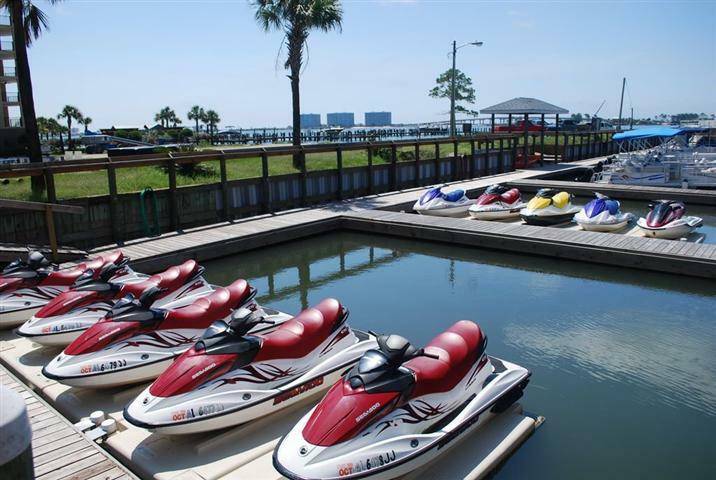 Largest Jet Ski Fleet in Orange Beach, Gulf Shores, Perdido Beach, and Fort Morgan!